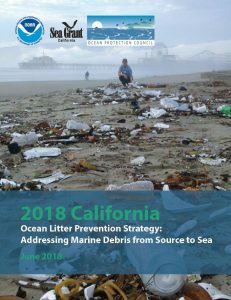 The Ocean Protection Council (OPC) has had a long-standing commitment to address ocean litter and is pleased to announce the release of the Final 2018 California Ocean Litter Prevention Strategy (Strategy). The Strategy acts as a foundational document for the marine pollution program’s work on ocean litter and plastic pollution. The Strategy was developed in partnership with the National Oceanic and Atmospheric Administration’s (NOAA) Marine Debris Program and in collaboration with California stakeholders. OPC adopted the Strategy at their April 2018 meeting, and the priorities and actions outlined in the document are meant to guide the State’s work on ocean litter for the next six years. In addition to the priorities outlined for the State, the Strategy also provides an outline of work that stakeholders can take on to address ocean litter. Please click here for an infographic summary of the Strategy’s contents. OPC and NOAA staff are partnering to facilitate the Strategy implementation process. If you or your organization is interested in getting involved in Strategy implementation, please join our implementation listserv here, or contact Holly Wyer at Holly.Wyer@resources.ca.gov. The OPC provided $20,000 from the Safe Drinking Water, Water Quality and Supply, Flood Control, River and Coastal Protection Bond Act of 2006 Proposition 84 to fund this project.